If you’ve ever been to Madison Square Garden for a New York Rangers game over the course of the last 35-plus seasons, there’s a good chance you stood for The Star-Spangled Banner, and you stood for John Amirante. 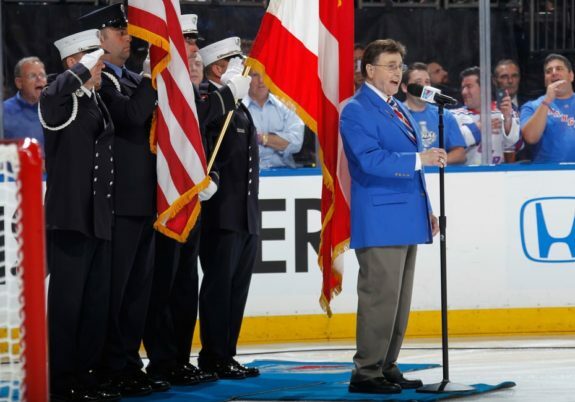 A fixture at New York Rangers home games, the popular anthem singer passed away Apr. 17, less than a month before his 84th birthday, but his voice will forever resonate throughout the Garden. Amirante had been a beloved fixture at Rangers games since Nov. 2, 1980. A kid from the Bronx who grew up a diehard fan of the Blueshirts, he made his mark on Broadway. While he also sang the anthem at New York Knicks and New York Yankee games, his work for the Rangers was always close to his heart and would define his career. Prior to puck drops, Amirante would emerge from the bowels of the Garden, walk out under the bright lights and onto the carpet that was placed over the ice. He would wave to the crowd and the faithful would respond with cheers and adulation. But when he began to sing, everyone got quiet. Game 7 of the Stanley Cup Final. The organ started and he sang in his baritone voice with his usual gusto and flair. But neither the Canadian or American anthems were audible. All anyone watching on TV or present in the building heard was cheering. The former Rangers captain added that the Rangers “lost a valued member of our ’94 team.” Back in 1994, the Rangers showed how valued Amirante was to the Rangers Cup run when he rode down the Canyon of Heroes just a few days later with the team. Regardless of the time of year, Rangers fans and players will tell you that Amirante’s voice set the table for every game. He got the crowd excited and the players pumped as the Rangers chant roared to life towards the end of his rendition. He may have even gotten visiting teams ready to go as Seth Rorabaugh of The Athletic Pittsburgh recalled a story of watching a focused Sidney Crosby break his pre-game ritual to speak with the iconic singer. Never one to turn away a fan for a picture, Amirante would even venture to viewing parties to get the fans ready for the game. But in 2015 the Rangers announced that Amirante’s last performance would be Game 2 against the Penguins. Petitions started, fans were upset and Amirante hinted the Rangers forced him out. He would return here and there after that game, and each time the fans cheered voraciously for the legendary singer – and then quieted down as he started to sing. John Amirante will be missed. His fist-pumping when he sang “bursting in air” will not be forgotten. His deftly pulling out a rally towel from his jacket when he sang “yet wave” during playoff games can never be replicated. And no one else should ever salute Ranger fans after completing the anthem. There was always a buzz in the air when those in attendance knew Amirante was going to sing the national anthem, and the games where he didn’t sing you could tell the fans were disappointed. Everyone knew the game would be a good one when he kicked things off and regardless of when he sang – either regular season or playoffs – the reaction to his short walk to the microphone would be deafening. Although John Amirante is now gone, his voice will always remain alive at Madison Square Garden. He was a true Blueshirt legend. Although John Amirante is now gone, his voice will always remain alive for the Ranger fans in their hearts. He was a true Blueshirt legend and his rendition of the national anthem should forever play on GardenVision in perpetuity.